If you’ve got a daily commute or if you travel often, podcasts are a great way to keep up with the latest news and your favorite entertainment; you can listen while you drive, fly, or take the subway, train, or ferry. But wouldn’t it be great if you could also absorb other information—say, articles you found online, email messages or attachments, documents you need to read for work, or even your daily RSS feeds—the same way? That question seems to have been the inspiration for Bit Maki’s Textcast, a nifty utility that lets you turn such text-based information into spoken-word audio files. And not just standard audio files, but podcast files handled by iTunes and synced to your iPod or iPhone, which means you can listen anywhere you normally listen to podcasts. To manually create a new episode (an audio file generated from text) using Textcast, first you select a textcast (a podcast consisting of one or more episodes) on the left-hand side of the Textcast window. Then you click on the New Episode (+) button at the bottom of the window, enter a name for the episode, and type or paste the text your want your Mac to “read.” You can get a preview of how the episode will sound by clicking on the Preview button, and you can edit the text of the episode (or any other textcast episode) right there in the program’s window. Clicking on the Sync To iTunes button creates audio files—Leopard’s high-quality Alex voice “reading” the text—for any new episodes, and then syncs those files to iTunes. Each textcast shows up as a separate podcast in iTunes, with each audio file organized as a separate episode in that podcast. Textcast also provides several convenient features for automating the process of getting text into the program. For example, if you’re reading an article in Safari and click on the Import Safari button, Textcast will create a new episode, name the new episode based on the name of the Web page, and then paste the text of that Web page into the episode’s text area. Syncing with iTunes creates the podcast episode for that Web page. Although this feature works well, note that Textcast imports all text from the active Safari tab or window, not just the text of the main article, so you’ll get any sidebars, text ads, or other content on that page. This means you’ll likely need to do some rough text editing in Textcast to delete the extraneous text. If a Web site provides a “print” or “text-only” link for an article or story, I recommend using that link before importing in order to get the cleanest text. Alternatively, Instapaper—the online service that grabs articles you come across on the Web and saves them for later reading—works great with Textcast, as Instapaper provides text-only versions of those articles; you just transfer your articles to Instapaper and then import them to Textcast from Instapaper.com. If you use NetNewsWire to read and manage your RSS subscriptions, Textcast adds an Import NetNewsWire button to its toolbar that works much like the Import Safari one: While reading an article in NetNewsWire, clicking on Import NetNewsWire creates a new episode based on that article. A Textcast-created podcast—this one of an RSS feed—in iTunes. Alternatively, and perhaps most conveniently, you can add an RSS feed directly to Textcast; each time you launch Textcast or manually refresh the feed, the program will download any new feed articles and create podcast episodes for each of them. 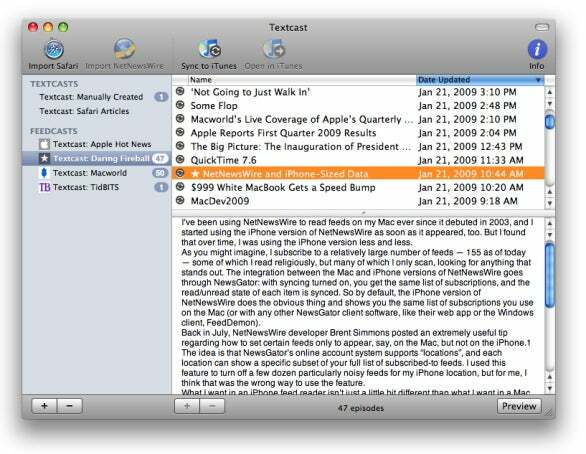 Bit Maki calls RSS-based textcasts feedcasts. I was impressed by this feature, although it’s less useful with RSS feeds that include only article summaries, rather than the full text of articles. Finally, if you’re an AppleScript guru, you can get text from other programs into Textcast using AppleScript. Textcast’s text-to-audio conversion process is surprisingly fast. On my first-generation Mac Pro, the program took less than a minute to convert a 5300-word article to an Alex-read audio file—obviously, much faster than real-time reading. Converting 30 articles—each containing the full text of the article—from TidBITS’ RSS feed took approximately 3:30. You can choose a different voice for your spoken-word audio files, but I recommend sticking with Alex, which is the best text-to-speech voice Apple’s ever included with Mac OS X. However, if you find Alex’s speaking rate to be too slow or too fast, Textcast’s Preferences window allows you to adjust the “reading” speed without affecting the voice’s pitch. (Alex was designed to be understandable at a wide range of rates.) I appreciated being able to increase the speed of speech to reduce the length of the resulting audio files. On the other hand, Alex still sounds a bit robotic and pales in comparison with a natural speaker—especially if your text isn’t in English—so you shouldn’t expect great oration. Textcast is a 1.0 (OK, 1.0.2) product, and there are a number of areas, mostly related to podcast management, in which improvements would be welcome. For example, you can’t move an episode from one textcast to another; Safari-imported articles are always created in a particular textcast, regardless of which textcast is selected; and I wish the program would add a distinctive prefix to textcasts and feedcasts when syncing them to iTunes so that all your Textcast-created podcasts would be grouped together. (You can add such a prefix manually.) Similarly, if you subscribe to an RSS feed, you can’t edit the text of RSS articles if, for example, you want to omit parts of those articles. Nor can you delete individual articles in the feed. The latter limitation is normal in an RSS reader, but in Textcast it means you can’t choose to not create or sync podcast files for particular articles. Finally, the current version of Textcast includes no documentation or Help system, so you’re left to discover its features on your own. Still, I’ve been enjoying Textcast, and I recommend it to anyone who has more time to listen to information than to read it. Although I’ve seen other text-to-audio conversion utilities, many generate those audio files in real time, and none offer the convenient features and automation of Textcast. It’s a clever program that works well and has lots of potential.